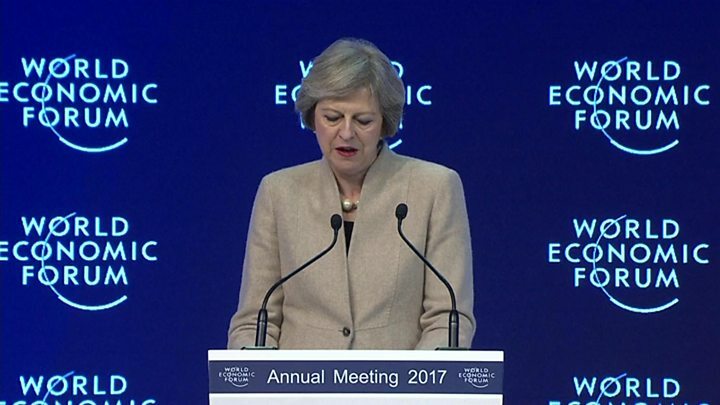 Theresa May has told leaders at the World Economic Forum in Davos that the UK will be a "world leader" on trade. But the prime minister also warned that inequality blamed on globalisation was aiding the "politics of division". Her speech to business leaders and politicians in Switzerland comes after EU leaders said a post-Brexit trade deal with the UK would be "difficult". The European Commissioner for Economic Affairs, Pierre Moscovici, said Brexit would be bad for the UK and the EU. In her speech, Mrs May said the world was enjoying an "unprecedented level of wealth", but many people felt this was "not working for them". Global elites needed to tackle the backlash against globalisation, liberalism, and free trade because leaders who "embrace the politics of division and despair" were working to exploit the situation. Mrs May said: "Talk of greater globalisation can make people fearful. For many it means their jobs outsourced and their wages undercut. It means having to sit back as they watch their communities change around them. "And in their minds, it means watching as those who prosper seem to play by a different set of rules, while for many life remains a struggle as they get by, but don't necessarily get on." I didn't expect Theresa May's speech to give so much emphasis to the downside of globalisation and, with it, implicit criticism of the international elite. She suggested that too many bosses were not playing by the rules of paying their taxes, taking on board their social responsibility or spreading the benefits of growth and wealth. That's quite a tough message when you're talking about people in front of you. Mrs May needs these people to be on board because they bring in billions of pounds of investment - she also needs them to be confident about Brexit. Her message to the international elite was fairly blunt: "You guys need to shape up the way you operate - we can't carry on as before." What about plans for the UK economy post-Brexit? The prime minister promised that the UK after Brexit would take on a "leadership role as the strongest and most forceful advocate for free markets and free trade anywhere in the world". She announced: "I am pleased that we have already started discussions on future trade ties with countries like Australia, New Zealand and India - while countries including China, Brazil and the Gulf States have already expressed their interest in striking trade deals with us." She argued for reforms so the global economy created wealth for all, rather than a "privileged few", and "centre-ground mainstream politics" could "work for everyone". In the UK, Mrs May said, she would announce her "industrial strategy" soon, adding that this would "address the longstanding and structural weaknesses of our economy". She said: "This is not about propping up failing industries or picking winners but creating the conditions where winners can emerge and grow." The prime minister promised a "bold, confident, open Britain" after Brexit. Earlier, Chancellor Philip Hammond warned the EU that the UK would have to find ways to stay competitive if there was no "comprehensive trading relationship" post-Brexit. He said: "Our first obligation of government is to make sure that our people are able to maintain their standard of living." How did EU and business leaders react? After the speech, Dutch Prime Minister Mark Rutte said the UK was "now making a choice to control migration, and they are paying a huge price because the economic growth rate of the UK will be impacted negatively by the fact that it will leave the biggest market in the world". German finance minister Wolfgang Schauble warned Mrs May her claim of the UK becoming "truly global" after Brexit would only be "taken seriously" if she did not slash taxes to attract business. Looking more broadly at the situation facing the UK after Brexit, Barclays chief executive Jes Staley said the bank was looking at routing some of its activities through its operations in Ireland and Germany but the "bulk" would remain in the UK. He told BBC Radio 4's Today programme: "I don't believe that the European financial centre will leave the City of London. "I think the UK will continue to be the financial lungs for Europe. 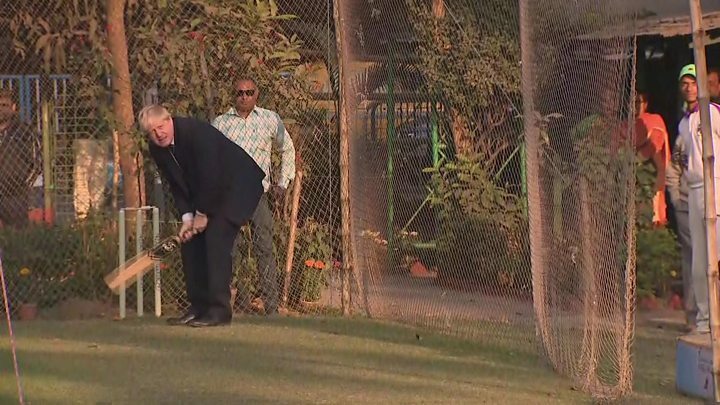 We may have to move certain activities ... but I think it's going to be at the margin and will be manageable." Lloyd Blankfein, chief executive of Goldman Sachs, said the bank had been moving parts of its "global operations" team to London, but was now "slowing that decision". Mark Wilson, chief executive of insurance and pensions firm Aviva, said: "We see significant opportunities to differentiate our business in the UK post-Brexit. We like the UK, we are investing in the UK, and we are growing in the UK." "She's presiding over a government that is cutting health spending, cutting social care spending, and at the same time threatening a bargain basement economy on the shores of Europe, with low corporate taxation undercutting of all the reasonable-quality wages and conditions that were achieved across Europe." Liberal Democrat leader Tim Farron said Mrs May had a "brass neck", adding: "She goes to Davos to lecture businesses about looking after the little guy, yet she threatens to turn the UK into Europe's biggest tax haven." 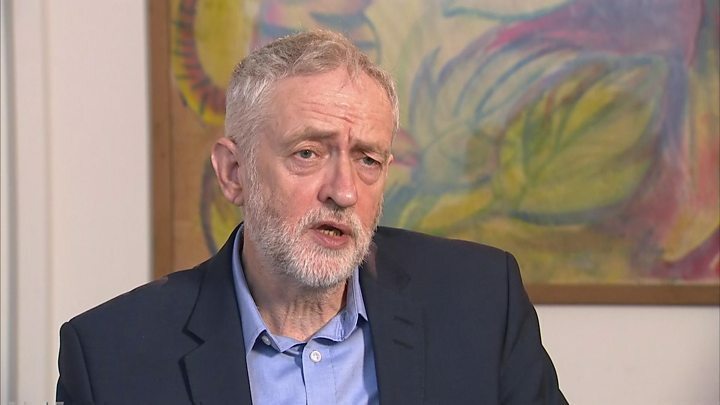 He argued that the government was "running our economy like it is a closing-down sale", while "higher prices and more expensive fuel mean families will feel the brunt of this government's bad economic policies". On Wednesday, Foreign Secretary Boris Johnson warned the EU not to penalise the UK for Brexit. He said that if French President Francois Hollande gave out "punishment beatings to anybody who chooses to escape, rather in the manner of some World War Two movie, then I don't think that is the way forward". But, on Thursday, French Foreign Minister Jean-Marc Ayrault responded, saying: "This is not about 'punishing' the United Kingdom. That is not France's stance." He called Mr Johnson's statement a "smokescreen to allow those who supported Brexit to play down the impact on people, because they can clearly see the negative consequences". However, interviewed at Davos by BBC economics editor Kamal Ahmed, Mrs May said: "The point that Boris was making was that actually it is in the interests of countries who will remain in the European Union and in the interests of the United Kingdom to get a good trade deal, to get a deal that ensures we see the least possible disruption to our economies." She added: "The point that Boris was making was a clear one. It's a point that I made in my speech earlier this week, which is that a good deal for the UK is going to be a deal that's good for the European Union." But Labour said the "wild and inappropriate comment" would not "improve the climate for negotiations". On BBC Newsnight, former World Trade Organization director general Pascal Lamy said of Mr Johnson's comments: "It's a clear embarrassment for all these high-flying diplomats in the Foreign Office and they deserve all our compassion." The prime minister had already delivered one speech on the UK's future this week, revealing on Tuesday her plans for the country's relationship with the EU and the wider world after Brexit. Leaving the European Union's customs union, but striking a new deal, although the PM said she had no "preconceived position"
A YouGov survey carried out after the speech suggests that 55% of British people think the deal the prime minister is seeking will be good for the country, compared with 19% who feel it will be bad. The poll suggests 20% of those who responded said they believed EU leaders would agree to the objectives Mrs May set out - 56% thought they would not. YouGov interviewed 1,654 British adults on Tuesday and Wednesday.